Today’s Nice Price or Crack Pipe Volare really checks off all the right boxes. It’s brown, it’s a V8, it’s a stick shift, and it’s a wagon. What more could you possibly ask? What’s that, a reasonable price? We’ll see, we’ll see. Wow, it’s been like a plumbers’ convention here this week with all the Crack we’ve had. Yesterday kept the streak alive as not even a racing provenance could overcome a seemingly too high price for our 1988 Mazda 323 GTX candidate, and it went down in a 70% Crack Pipe loss. Yesterday’s car once set records at the venerable Bonneville Salt Flats. Today however, we’re going for a car that might just set the record as the most Jalop car we’ve ever had here. Let us count the ways. 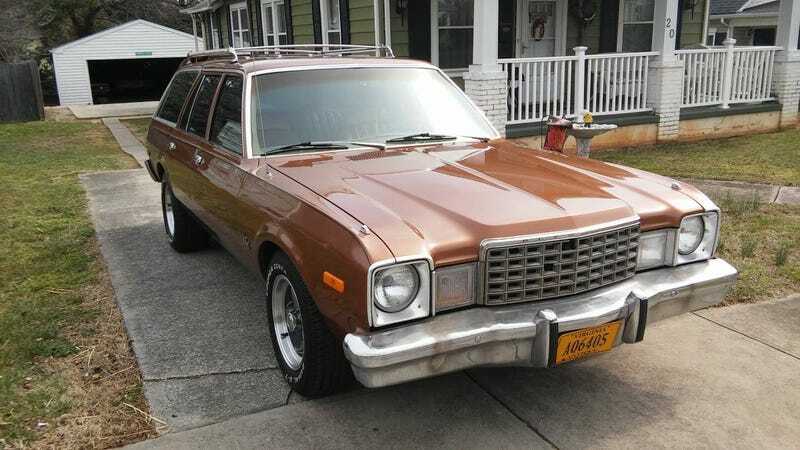 This 1978 Plymouth Volare wagon is, first and foremost, a station wagon. We love those for their versatility, sleep-ability, and perhaps some sort of Oedipal, return to the womb subconscious attraction because our mom drove one-ability. It’s also a V8, sporting Mopar’s legendary and keenly modifiable OHV 318 under its hood. Backing up that V8 is a stick shift gearbox, notably an 833 Overdrive 4-speed, which sends power back to a lively live axle. And the cherry on top? It’s painted in glorious metallic brown. Like I said, it’s got it going on. The ad says the car has too many new parts to list, but seeing as Craigslist doesn’t charge by the word, I think the seller’s just being damn lazy. What we do know is that it looks to be in perfectly serviceable shape, with no evidence of road rot or body damage in the pics. That’s pretty laudable as these cars, and their Dodge Aspen brothers, rightfully gained a reputation for succumbing to rust seemingly starting at the assembly line. The bodywork looks to be amazingly plain jane, with no trim cluttering up the basic design and handsome center caps and trim rings in place of the fancier full covers on the wheels. Chrome may be “meh” at best, and the grille is missing some of its grillers, but at least the paint looks good. And it’s brown. Under the hood you’ll note a nice but brand-inappropriate blue on the engine. That may indicate sufficient work to have required its removal from the car, or perhaps just some very tactical rattle canning. The big chrome air cleaner housing lacks the nose for the heat riser so the port on the driver’s side manifold goes unused. Other than that you’ll probably only note that the car’s A/C is of the 4/70 sort—four windows down, and 70 miles per hour. Also, what’s holding down that battery? Inside you’ll find big buckets up front and a bench in back. No, that’s not fine Corinthian leather in there, a fact proven by the fraying vinyl on the driver’s side throne. Windows are of the armstrong power variety and the black carpet looks out of place in the otherwise caramel-colored environment. Also, props to whomever can identify the model of the model car on the floor in the back seat shot. No mileage is given, nor much of a description of condition other than the expected “drives like a dream,” but that’s okay as this Plymouth has so much going for it that minor issues like moon shot mileage or a family of rabid opossums having taken up residence inside it might be waved away as merely inconsequential distractions. Perhaps less inconsequential is the asking price, which is $5,000. What’s your take on this oh-so perfectly kitted car and that $5,000 price? Is that a fair deal for so Jalop a ride? Or, is that too much money to go with an old Mopar? Blacksburg Virginia Craigslist, or go here if the ad disappears. H/T to LeaksOil for the hookup!